Thanks for stopping by and I hope your weekend is off to a great start! Wow!! Stunning and sooooo cute wedding card!! :D You are just a magician with your punches!! I have never thought to make an elegant wedding couple with an owl punch!! So cool! :D Any little detail is just perfect!! The bride with the embossing, the hat, the tulle, the pearls, the hearts... and the touch of sparkling!! A true masterpiece!! Very well done!!! You win the Queen of Snippets award with this pretty card Carol! Love the little owls and all those tiny details you added. A beautiful card. Wowser, this is stunning Carol! One to try and 'copy' but certainly there would be no comparison! Love it and I bet the happy couple did as well. 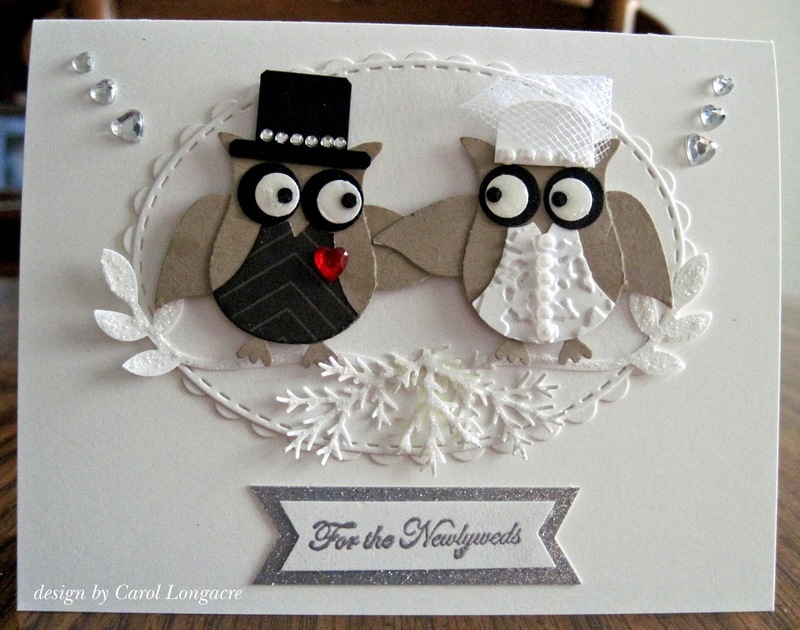 A fun wedding card Carol, I love your adorable Owl couple. That is so adorable that I can't find the right words. Such details! I just love her little headpiece! What a fun wedding card. So cute and fun! I am sure this will be a card they will always cherish. Oh Carol, this is super cute! What a lovely card to cherish and enjoy! What a brilliant card Carol, so many lovely details. So adorable! Makes want to get out my owl punch again!